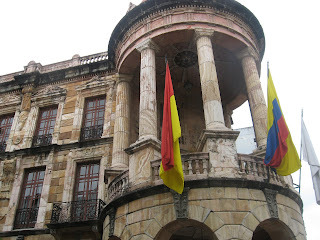 town squares, and is considered Ecuador's most charming city. National Geographic says that Cuenca is the best place in the world to live, and that is why so many North Americans are moving there. The year round temperate climate, abundance of fresh fruits and vegetables, clean high quality potable water, quality affordable health care, the sound of the church bells each morning, the goats and cows grazing along the river, and of course Ecuador's roosters crowing at all hours, all contribute to the quality of life. Cuenca was relatively isolated until the mid-1960s, when the first paved road connected the Andean city to the outside world. llamas, puma, spectacled bear, condors, toucans, and hummingbirds. 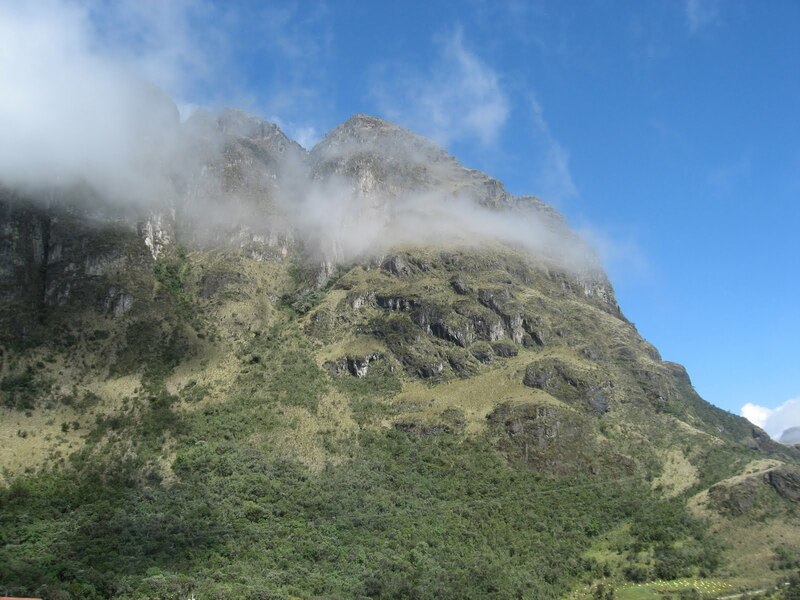 The rapid ascent when traveling from sea level into the Andes ( 8,400 ft ) can expose one to acute mountain illness and lung problems. (about one half of people reaching 10,000 feet without acclimatization come down with it.) Our diesel truck seems to suffer from a lack of oxygen and runs poorly at high altitudes. Cuenca, the third largest city in Ecuador ( pop 500,000 ) is the capital of the southern Ecuadorian province of Azuay. bakeries, heladerias, coffee bars, and restaurants. In 1999 Cuenca was declared a " World Cultural Heritage Sites" by UNESCO, which also declared Quito in 1978. In contrast with Quito the city seems more planned with more consistent colonial republican architecture dominated by brick buildings with red clay tiled roofs. 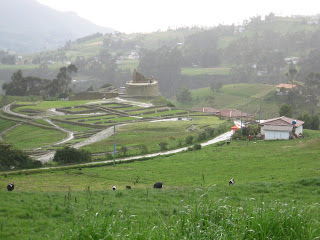 A little history - Cuenca began as a Canari settlement called Guapondelig meaning " plain and wide as the sky " In the 15th century it was taken over by the Incas in the most northerly reaches of their empire, and transformed into the palatial Tomebamba. 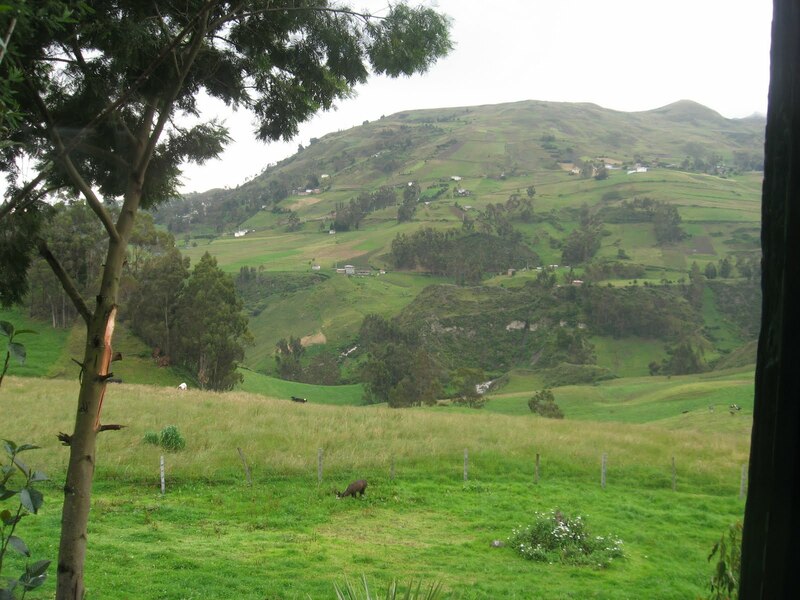 The grounds and buildings were reported to rival Cuzco. Spanish lieutenant Gil Ramirez Davalos founded the city in 1557 as Santa Ana de los Cuatro Rios de Cuenca. Rio Tomebamba which drains from El Cajas National Park divides the city's historical district from the modern suburbs. Rio Yanuncay also flows from the west to join Rios Tarqui and Machangara to form the Rio Cuenca to flow eastward into the Amazon jungle. popularly known as El Barranco. Our room in the Hotel Victoria overlooked the river banks and Parque de la Madre. 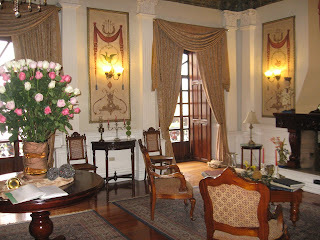 Hotel Victoria's restaurant El Jardin is noted as one of the cities finest with a wonderful view of El Barranco. church for every Sunday in the year " We will highlight the special churches. Parque Calderon is flanked by the Catedral Nueva and Catedral Antigua. stained glass windows from Belgium and Germany, and the pink marble facade are unique. Inside is a large stature of Pope John Paul II which commemorates his visit to Cuenca in 1985. The enormity of the cavernous marble central nave will not fail to humble you into reverence, no matter what religion you might be. Four pillars and the canopy they support on the altar are studded with gold leaf. Normal for Latin America & Europe underneath the church are the tombs for many of the community's religious and political leaders. A tunnel underneath the square joins the two churches. Catedral Antigua or El Sagrario, on the east side of Parque Calderón, was the first church in Cuenca built in 1557 with stones from the Incan ruins. In the balcony is the organ built in and transported from Germany in 1739. The altar is elaborate with life-size figurines of Jesus and the apostles. 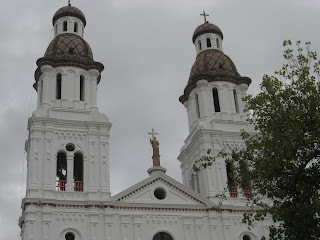 The Neocolonial Iglesia San Francisco has a modest pink and white stucco exterior. Inside is a flamboyant and intricately carved altarpiece full of alcoves occupied by statues and a gold-leaf pulpit. Iglesia Santo Domingo built in 1563 has geometric motifs covering the arches and ceilings and 18th century paintings decorating the walls. Iglesia San Sebastian marks the western edge of colonial El Centro. Iglesia San Blas marked the opposite edge of the city dating back to 1575 and built with stone from Pumpungo. Todos Los Santos is one of the oldest churches in Cuenca ( 1540 ) and is currently under restoration. San Alfonso - 1875 Gothic construction, upon entering the carved wooden doors one will find corinthian columns and a collection of original oil paintings. Carmen de la Asuncion a monastery founded in 1682 by Marianita de Jesus. The Sanctuary of Maria houses many important religios antiques. Iglesia de las Conceptas is a simple convent built in 1686.
tinsmiths and an organic coop. Family tiendas can be found on every block, vendors on bicycles, and squatters selling their produce on the street from wheelbarrows. Two big markets we visited in El Centro are 10 de Agosto, a sprawling two-story building, and 9 de Octubre a slightly more compact building with three-stories. grains, beans, bread, pastries, chocolate, sundries, juices, almuerzos, and prepared foods. The Feria Libre is an enormous several acre mercado on Avenida de las Americas. It's a huge produce market that sells everything you can imagine, including live animals: chickens and chicks, pigs, guinea pigs, and goats. We also strolled through the flower market & indigenous craft market in plaza de San Fransisco and the CEMUART "Centro Artesanal Municipal Casa de la Mujer" where a great variety of artisans can be seen working. When we leave our coastal village we always enjoy the gastronomy and variety of culinary cuisines offered by a larger city. At a cost of $ 5 the double decker bus tour is a good way to gain a 90+ minute overview of the city highlights and attractions. Pumapungo ( Puma's door ) Museum is an archeological complex of agricultural terraces, tunnels, and mausoleum reflecting the religious, military, and political nature of the Incan centre. This metal statue of a man coming out of a volcano representative of the metal workers in the area. Puente Roto - the broken bridge which used to cross the river until it was damaged in a major flood in the 1950's. The Central Interamericano de Artesania y Artes Popular (CIDAP) museum is in a wonderful, restored colonial building adjacent to the Victoria Hotel along the river featuring a variety of South American artists and handicraft exhibitions. Cuenca is home to 3 major Universities in Ecuador & Colegio Benigno Malo one of the oldest prestigious schools. The bustling Plaza de los flores delight's one's senses with colour and fragrance. mimes, jugglers, a variety of other artists, and the romantic horse drawn carriage. The absence of animal excrement in the streets and men urinating in public was very obvious from coastal Ecuador. The Alcazar hotel once a former President's residence with beautiful gardens and brimming with classic antique furniture. Sumaglla Antiquedades home to a delightful lady with an extensive antique collection. and active artesan community with the renowned Ecuadorian artist Eduardo Vega's home, Workshop and Gallery. His specialties are artistic ceramics. You can admire his latest creations ranging from mugs, plaques, jewelry, and wonderful murals of Ecuadorian landscape,costumes, flora and fauna. Throughout the city you will find ceramic street maps of Cuenca designed by him. We visited the Artesa factory famous for exporting Ecuador hand painted ceramics throughout the world, and purchased a few items of pottery. One of the world's classic ironies is that Panama hats are, and have always been, made in Ecuador. Jipijapa and Montecristi have been at the center of the toquilla-straw-hat trade since the 17th century. Cuenca noticed the growing export demand for the hats and seized the opportunity to boost its economy. It opened a straw-hat factory, trained weavers, established supply lines for the paja toquilla from the coast, automated the process with hydraulic presses and hat forms, and hired master weavers. In the 1830s, Ecuador's sombreros de paja toquilla, or "hats of toquilla straw," were originally marketed in Panama. This was the main route for travelers between the coasts of North America. When gold was discovered in California, these strong, lightweight, straw hats became popular. They were highly prized for their ability to deflect the tropical sun, allow ventilation, fold for compact storage, and accessorize summer-weight silk suits. We had a guided tour through the Homero Ortega straw hat museum and one of the original hat factories in Cuenca. A paja toquilla forest takes three years to mature. The plant is cut and the fibers are stripped thin, boiled, and hung up to dry for around a week. Next, the straw is woven into the rough hat. The hats are bleached and dried; the brim is ironed and trimmed of excess straw. Then the crown is shaped, using special presses and different-sized forms that combine the optimal heat, humidity, and pressure to impart the desired shape and feel. The brim is finished by cutting it to the desired width and reinforcing it, then a band is stitched inside the hat and another is placed around the hat on the outside. The quality is in the tightness of the weave and the skill of the weaver. A hundred weaves per square inch are considered minimal; the highest quality and most expensive hats have as many as 2,000 weaves per square inch. Even then, the superfino Panamas are so expertly woven that, reportedly, they can hold water. They can be rolled up so small for storage or traveling that they can pass through a wedding ring. These hats can sell for thousands of dollars, though you can also buy pedestrian Panamas around town for as low as $30. Below are links to a wealth of additional information on attractions in Cuenca and blogs on daily life experiences for those who wish to " live the dream vicariously. " We returned to the coast on the northern route through Azogues. About one hour to the north is Ingapirca the Incan Temple of the Sun was used for Canari & Incan cultures for ceremonies and rituals. A reminder that in all our web pages highlighted underligned colored text represents an active link, and you can enlarge the photos by simply clicking your mouse on them. If you are interested in more details on daily life in Cuenca there are a multitude of blogs from expats describing their experiences. The first few have lived in Cuenca for more than several years, while the rest are relatively new to Cuenca. Muchas gracias, we are glad you enjoyed. It is excellent, with a very professionally done blend of beautiful high quality photos, short videos, and brief but poignant texts of what you are viewing that is comprehensive and awe-inspiring. How the Millards were able to accomplish all this from just a one week visit to Cuenca, I find amazing. If I were still a World Cultures and World Geography teacher, I would not hesitate to use “Pachamama Spectrum of Treasures” as a classroom resource tool. Thank you Jim for your very kind recommendation. to me. Anyways,I'm certainly pleased I stumbled upon it and I'll be book-marking it and checking back regularly!